Picking the perfect outfit for your engagement shoot can honestly seem like a daunting task. Let’s be real, here. The outfit selection process can be stressful. And unfortunately a quick search on Pinterest doesn't always provide the results you may expecting. As wedding photographers well-versed in color theory and styling, we're here to help you sort through your closet to find the perfect outfit for your upcoming engagement session. Our guess is that you probably already have a million questions swirling around in your head. Where do you even begin? Should you and your boo wear matching colors? How casual is too casual? Which shoes make the most sense? These are the questions we hear all the time. As a team of adventure wedding and elopement photographers, we totally get it. Picking out the right outfits for your engagement shoot or adventure session is as much a science as it is an art, and we're here to help demystify the whole process for you. We totally understand that you both want to look put-together and intentional with your outfit choices, but wearing the same exact colors more often than not tends to look tacky and posed (There are exceptions, of course. For example, a white dress for the ladies, paired with a white shirt on the guys can look beautiful. But white and black tend to have a lot more wiggle room than most colors). A great place to start is a monochromatic color palette. Now you're probably thinking, what the heck does that mean? Basically, rather than both of you trying to wear the exact shade of blue, try wearing different shades of the same color. This gives your outfits enough distinction so they don't look “matchy-matchy.” But you also get the added benefit of a cohesive look between the two of you. Alternatively, each of you can wear different core colors, but have accents of each other’s main color in your clothing. This allows your outfits to tie in to each other, without being exactly the same. So for guys, this could mean wearing a denim button down with khakis. And then, for girls, you could have a white dress with blue accents that are a similar shade to your partner’s denim shirt. This is a nice way to keep some consistency but also have your own distinct look (the image of Shelby and Andrew in the top left is a great example of this!). The key thing to remember here is that you want some sort of color or texture to be consistent across the board. There needs to be something similar in both of your outfits, without them being practically the same. That way your looks are cohesive, while having enough variety to keep things interesting. We completely understand that you may want to dress up a little for your engagement shoot, and that's totally fine! But when we photograph our couples during their engagement and adventure sessions, we tend to have them moving around quite a bit: running together, spinning each other around, jumping, and even climbing up onto surfaces. Because of this, you’ll want your outfit to be able to move with you comfortably in these types of situations. 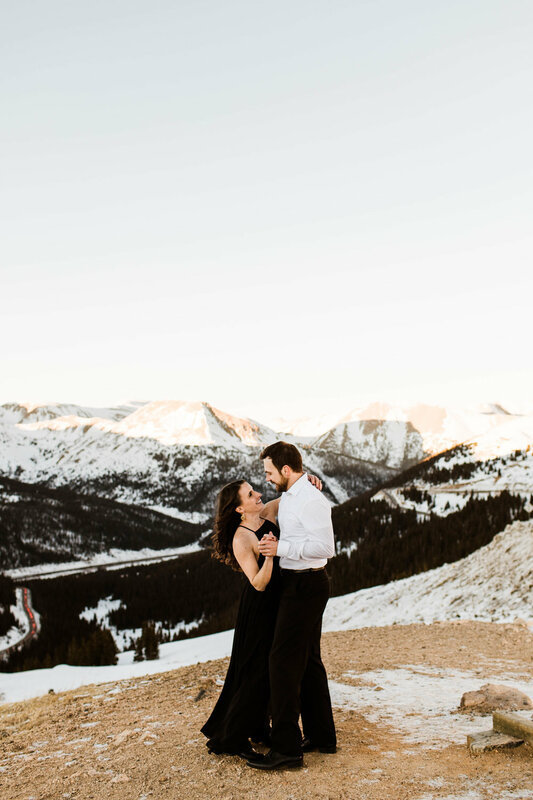 This tip is especially important for couples who’ve opted to have a mountain engagement session, where a full range of motion and movement will be super helpful. We usually recommend that ladies wear flowy dresses and blouses. Not only are these comfortable clothing options, but they tend to look absolutely stunning when blowing in the wind. Guys tend to luck out in this department, since pants are typically easy to move around in. As for shoes, we love telling our ladies to pair their dresses with a cute pair of comfortable boots. If your engagement shoot is happening during the summer months, a nice pair of flats or a low heel works just as well. Just make sure you’re wearing something you could potentially be okay hiking around in, particularly if your engagement session is happening in an outdoorsy, adventurous location like a national park. For guys, try to avoid sneakers — you can still opt for a comfortable shoe, but choose one with less of a “workout” feel to it. Dress up your look with a pair of leather or suede dress shoes. That being said, since we primarily shoot in Colorado and so many couples like to have their engagement sessions in the mountains, we highly recommend bringing a pair of hiking boots (or shoes with a good bit of traction) to wear on the way out to the engagement photo location. You definitely don't want to be trekking through the mountains with dressy shoes. We love recommending a neutral or earthy color palette to our couples. These colors (including forrest greens, beige, gray, white, browns, and blacks) tend to photograph beautifully. They complement the two of you without overpowering your whole engagement look. This is an especially striking look for outdoors engagement sessions. Notice how Candace and Roshan’s engagement outfits in the photo above beautifully complement the earthy backdrop of the rock wall and waterfall? If you two decide to include a more vibrant color in your outfits, be sure to use it as an accent color rather than the primary color. Vibrancy is absolutely fine, but it stands out best when it isn't too overpowering. Again, the thing we really want to stress in your engagement photos is the interaction between the two of you, not your outfit. Your clothing should enhance the moment, but it most definitely shouldn't steal the show. Oh, and one last little thing. As elopement and adventure wedding photographers, we pride ourselves in being the go-to resource for couples looking to feel their best during their engagement sessions. We’re there for you, guiding you through the entire engagement and adventure wedding planning process. We love to say we take epic photos of epic couples in epic places. But honestly, we’re here to help you with so much more than that. So if having hands-on wedding photographers and guides on your adventure wedding or elopement day sounds like your jam, we’d love nothing more than to get in touch with you. Elopement and adventure wedding planning shouldn’t be difficult. We’re here to make sure it isn’t. Chat With Us About Your Dream Wedding!